Here's the thing...when we moved to this house, I was uberly excited at the thought of having a PLAYROOM! A place for all of the toys to call home...other than the middle of our living room. No more scrambling to clean up 3,249 dolls and tractors so that the our visitors are welcomed to a (very loosely used form of this word) somewhat "organized" home! No more stepping on little cars in the middle of the night and holding your breath while you die in pain so that you do not wake up a sleeping child from your screams. No more pushing toys on to the floor just so you can find a place to sit on not-so-inviting couch. So, yes, I was ECSTATIC to have a PLAYROOM! More so than the kids, for this I am sure. 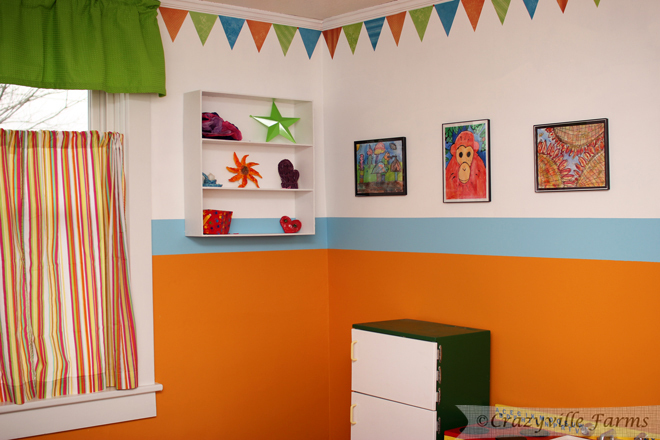 However, I was hitting a bit of a wall when it came to choosing a paint color that would work. As you may remember, it started off a lovely shade of poo green. Then, with my great ability to pick out paint colors, I chose the wonderful color of pee yellow to paint over the said green. Yes, the room looked like the kids had been decorating with a dirty diaper or two. Sorry, for the analogy, but it's the truth! Fast forward to this spring when I became in LOVE with the color orange. Actually, I have a hidden obsession with orange although you may never know it...unless you're Levi. Poor kid is dressed in orange pretty much EVERY day! Though, I will say that he looks rather smashing in beautiful shades orange and blue. Anyway, my point...I finished painting the room some time before summer, but then that was it. The top half of the walls were stark neckid. As Merisa said, "They're screaming 'PAINT ME'". I was at some sort of standstill and couldn't decide what to do with the upper portion of the walls. I wanted something funky...something bright. But what? Then, the other day it came to me. I thought about painting this design, but decided that would take way more time that I had. See, the boys were sleeping, which means I have a small window of opportunity. So I grabbed some scrapbooking paper (which I already had) and sliced the sheets into triangles. I made 6 triangles per 12 x 12 sheet of paper, which means I ended up cutting quite a bit of paper in order to trim out the entire room. Anyway, here's the finished project. Well, almost finished. I still have something I need to add to one of the walls. Just haven't gotten there, yet. 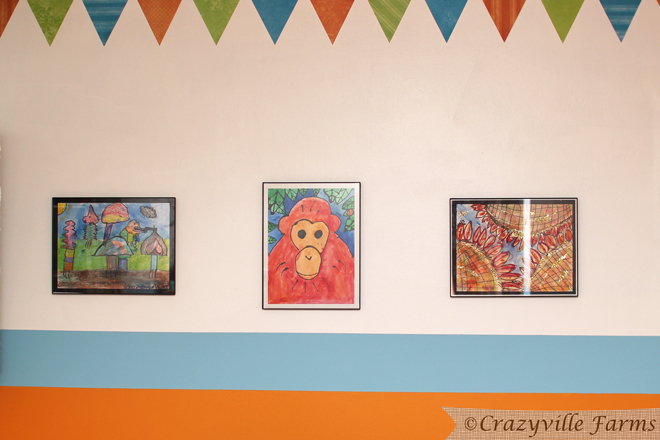 Oh, the framed artwork and sculptures on the shelf are courtesy of a future Monet...Miss Merisa. Seriously, that girl has talent! She's very abstract with her art, and I love it!!! There ya have it! 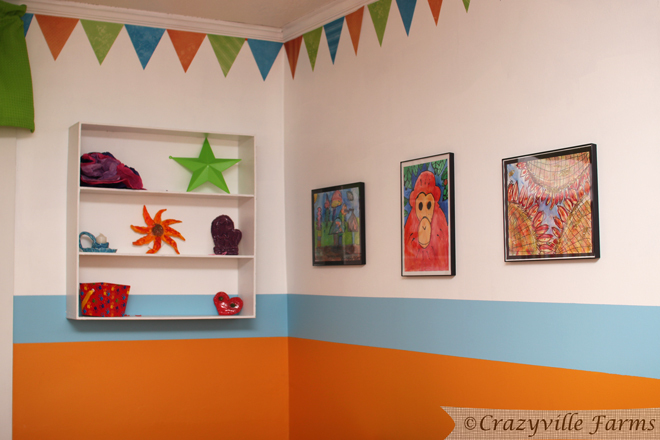 A bit of our playroom revealed! 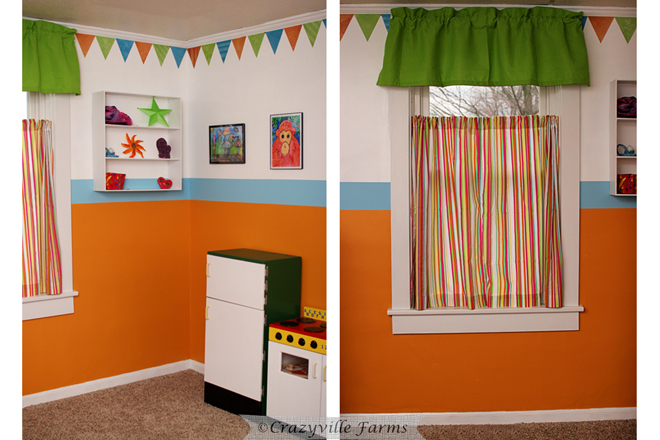 The curtains are circa Goodwill 2012, and the walls display custom artwork. Could it get any better? *Disclaimer: My dreams of a toy-free living room have been shattered! The toys have a stupendous ability to migrate to EVERY room of our house in a matter of seconds. Seriously, it's mind-bending! SOOOO cute! I love the colors and patterns you chose! !